(Bloomberg) -- Tesla Inc. is facing multiple legal events and rising key-man fears regarding billionaire CEO Elon Musk that aren’t being adequately priced into options, according to JPMorgan Chase & Co. 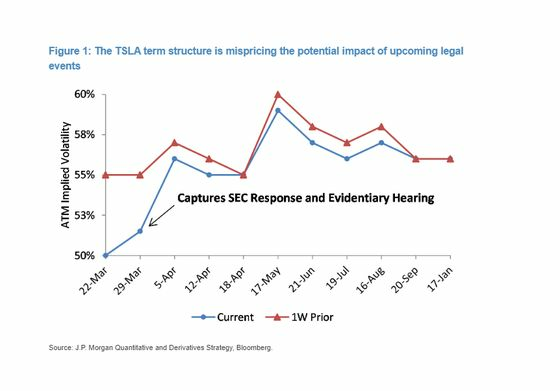 They recommend buying Tesla puts expiring in April to take advantage of the mispricing. While it’s difficult to determine what the result of the legal developments will be, JPMorgan said “another slap on the wrist (i.e. a larger fine) appears unlikely” given Musk’s “ongoing public belligerence” toward the U.S. Securities and Exchange Commission, among other things. He could even be removed as chief executive officer, they noted. JPMorgan auto analyst Ryan Brinkman is one of Wall Street’s most bearish on Tesla -- he’s underweight the stock, with a 2019 price target of $230. The shares have lost 17 percent this year, closing Friday at $275.43, their lowest price since October. In addition to the legal issues, Tesla shares aren’t rebounding from negative news and are failing to gain on positive headlines, the strategists wrote. They cited the resignations of the chief financial officer and general counsel, softening demand for Tesla models, the Model Y reveal and erratic behavior by Musk as examples.